The Boston Red Sox head to Yankee Stadium on Friday, September 1, 2017 to take on the New York Yankees. The expected starting pitchers are Doug Fister for the Red Sox and Sonny Gray for the Yankees. The odds for this matchup have Boston at +144 and New York at -160. The Red Sox have a 58-69-6 over/under mark and a 70-63-0 run line record. 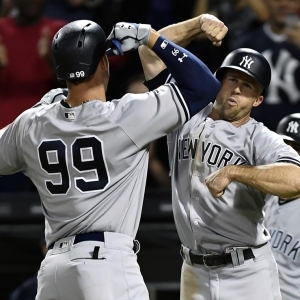 The Yankees are 69-63-0 against the run line and have a 68-61-3 over/under record. The Red Sox have a 76-57 overall record this season. Starting pitcher Doug Fister has a 3-7 record with an earned run average of 4.53 and a WHIP of 1.37. He has 51 strikeouts over his 59.2 innings pitched and he's given up 55 hits. He allows 8.3 hits per 9 innings and he has a FIP of 4.45. The bullpen has an earned run average of 3.24 and they have given up 348 base hits on the year. Teams are hitting .228 against the bullpen and they've struck out 426 hitters and walked 138 batters. As a team, Boston allows 8.4 hits per nine innings while striking out 9.4 batters per nine innings. They are 4th in the league in team earned run average at 3.69. The Red Sox pitchers collectively have given up 1,131 base hits and 494 earned runs. They have allowed 155 home runs this season, ranking them 23rd in the league. Boston as a pitching staff has walked 369 batters and struck out 1,265. They have walked 2.8 men per 9 innings while striking out 9.4 per 9. They have a team WHIP of 1.24 and their FIP as a unit is 3.72. As a team Boston is hitting .262, good for 7th in the league. The Red Sox hold a .413 team slugging percentage and an on-base percentage of .334, which is good for 9th in baseball. They rank 6th in MLB with 9.1 hits per game. Mookie Betts is hitting .263 with an on-base percentage of .341. He has 139 hits this season in 529 at bats with 78 runs batted in. He has a slugging percentage of .437 and an OPS+ of 103. Xander Bogaerts is hitting .273 this year and he has an on-base percentage of .335. He has totaled 129 hits and he has driven in 51 men in 472 at bats. His OPS+ is 94 while his slugging percentage is at .405. The Red Sox have 1,210 hits, including 243 doubles and 142 home runs. Boston has walked 474 times so far this season and they have struck out 979 times as a unit. They have left 940 men on base and have a team OPS of .748. They score 4.81 runs per contest and have scored a total of 640 runs this year. New York has a 70-62 overall mark this year. With an earned run average of 3.26, Sonny Gray has a 8-8 record and a 1.18 WHIP. He has 120 strikeouts over the 127 innings he's pitched. He's also given up 107 hits. He allows 7.6 hits per nine innings and his FIP stands at 3.35. The bullpen has an earned run average of 3.48 and they have given up 346 base hits on the year. Teams are hitting .210 against the Yankees bullpen. Their relievers have struck out 522 batters and walked 181 opposing hitters. As a team, New York allows 8 hits per nine innings while striking out 9.5 batters per nine innings. They are 5th in the league in team earned run average at 3.82. The Yankees pitchers as a team have surrendered 1,048 base knocks and 502 earned runs this season. They have given up 159 home runs this year, which ranks 20th in Major League Baseball. New York as a staff has walked 411 hitters and struck out 1,251 batters. They give up a walk 3.1 times per 9 innings while they strike out 9.5 per 9. Their team WHIP is 1.23 while their FIP as a staff is 3.92. As a team, they are batting .259, good for 9th in the league. The Yankees hold a .437 team slugging percentage and an on-base percentage of .336, which is good for 5th in baseball. They rank 8th in MLB with 9.0 hits per contest. Brett Gardner comes into this matchup batting .259 with an OBP of .349. He has 126 hits this year along with 53 RBI in 487 AB's. He maintains a slugging percentage of .433 with an OPS+ of 104. Aaron Judge is hitting .280 this season and he has an OBP of .412. He has collected 126 hits in 450 at bats while driving in 82 runs. He has an OPS+ of 156 and a slugging percentage of .578. The Yankees as a unit have 1,185 base hits, including 213 doubles and 188 homers. New York has walked 501 times this year and they have struck out on 1,162 occasions. They have had 970 men left on base and have an OPS of .772. They have scored 5.17 runs per game and totaled 683 runs this season. Who will win tonight's Red Sox/Yankees MLB game against the spread?